for people visiting over 50% of the manned rigs in the UK Continental Shelf. Explore the world’s most powerful and popular Software as a Service Platform for the Oil & Gas Industry. Onboard Tracker™ – People & Assets made visible. Look familiar? We can help! 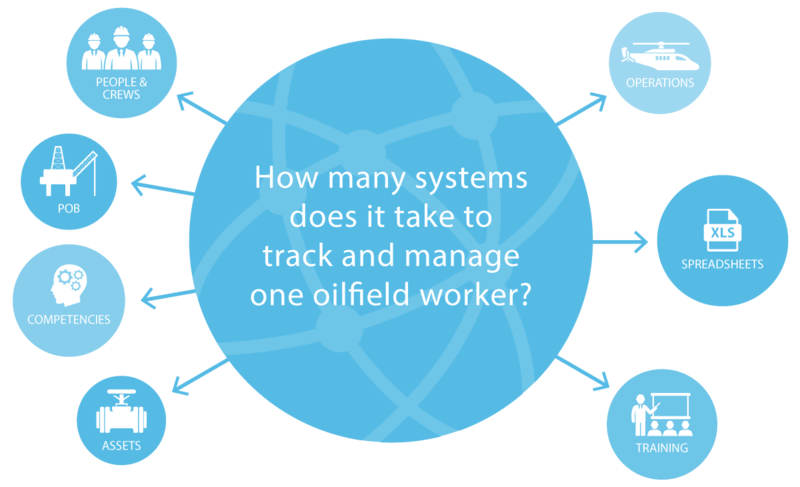 Onboard Tracker™ is an easy to use online tracking, operations, competence and certification hub which enhances the visibility and safety of people, crews and assets in global oil and gas. Onboard Tracker™ reduces the number of systems used to track your people & assets whilst transforming visibility and reporting in your company. Our modular structure & import features cut your costs, duplication & set-up time. From purchasing the system we went live globally within a month, with no issues whatsoever. (...) The Onboard Tracker™ team aren’t sitting still either and we are continually in contact with ideas to expand what Onboard Tracker™ can do for our business. Onboard Tracker™ has been hailed our best IT success. We no longer lose time tracking data down – it is right there and we can access it whenever needed. The Oboard Tracker™ delivered the promised benefits. And even more! Onboard Tracker™ connects to your systems through our API. Save time, Integrate and Consolidate Data. No more Excel Spreadsheets floating around! One centralised place to manage all offshore operations, personnel logistics, competency, certification, training and HR. Onboard Tracker™ is a modular, web based Software as a Service (SaaS) platform that grows with your business. Onboard Tracker™ is a monthly subscription model with no upfront capital cost. Onboard Tracker™ uses secure, globally-replicating data centres for resilient worldwide access across multiple locations. Onboard Tracker™ in collaboration with Archer UK and the University of Aberdeen was the finalist of Oil & Gas UK Awards in the ‘Business Innovation’ category. Graphically track the work, holiday and absence movements of roaming and rotational people or crews on jobs, sites & locations worldwide. Upload skill levels, assessment evidence and experience to ensure crew safety and compliance against client, location & equipment specific matrix requirements. Upload and manage training certificates, records, documents and expiries to ensure workforce safety and compliance with client and regulatory matrix requirements. Manage your staff, contractor and agency contracts. Administer succession, appraisals, disciplinary tracking and accident recording. Looking for a nimble system that you can rely on? Onboard Tracker™ ‘s SaaS model ensures that the system is fit for purpose, performant, and continually improved rather than decaying from the moment of implementation like traditional systems. Interested, then get in touch!